It’s good to be back in the prairies after spending last week in the mountains. The mountains were beautiful and daytime temperatures were pleasantly cool, but I sure enjoyed the chance to catch up with the goings on in our prairies yesterday. As if to welcome me home, the weather provided about an hour of bright overcast skies and light winds around lunchtime – perfect weather for a little close-up photography. 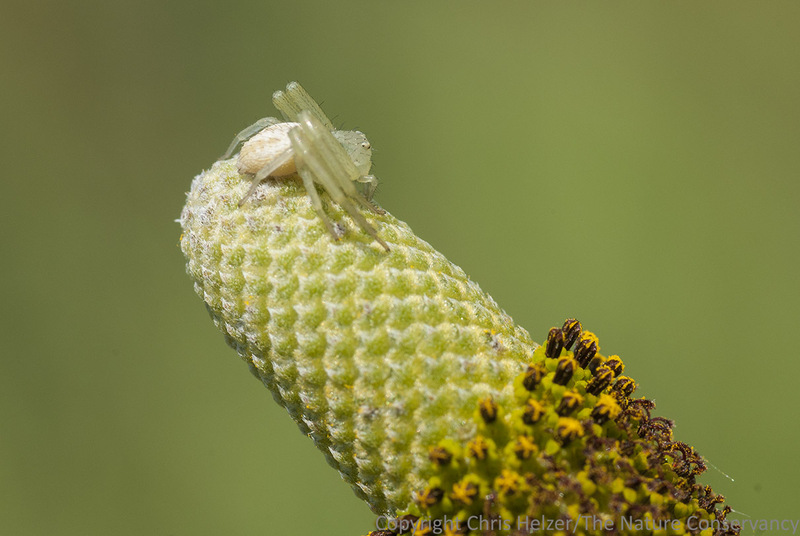 As I wandered, I found a crab spider perched atop an upright prairie coneflower (Ratibida columnifera) flower. I’m a sucker for crab spiders, so I crept up and snapped a photograph of it. 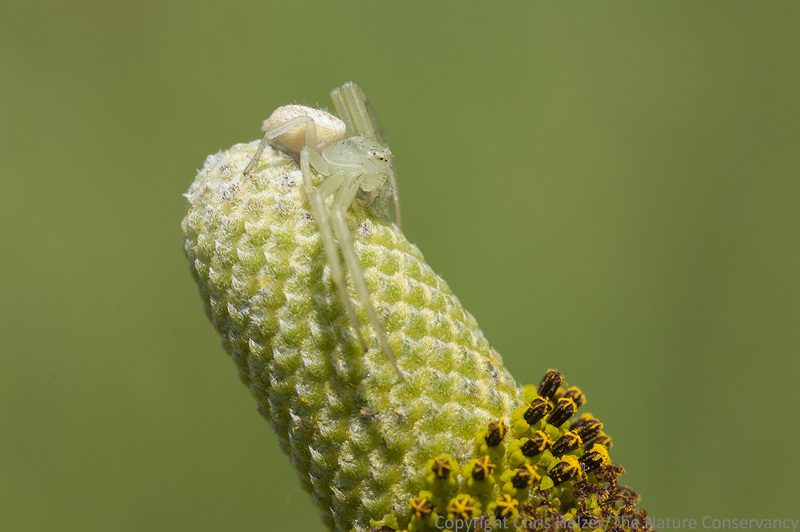 Crab spider on upright prairie coneflower. The Nature Conservancy’s Platte River Prairies, Nebraska. I was surprised the spider was sitting so high on the flower – it seemed awfully visible to predators, and poorly placed to capture pollinators coming to visit the blooming portion of the flower below. Just as I was wondering what it was up to, the spider answered my question for me. It popped itself up on its “tiptoes” and let loose a long silk trail. If you look closely, you can see a long silk thread emerging from the abdomen of the spider. The spider was attempting a technique commonly called “ballooning”, though “kiting” seems a more appropriate term. Small spiders use ballooning to travel long distances by releasing long silk threads into the breeze and floating off to wherever the wind carries them Often, the spider only goes a short distance, but it’s still a faster mode of transportation than walking on short little legs! Sometimes, if the wind is right, a ballooning spider can go many miles. In this case, the light winds were apparently insufficient to carry the spider off, and after it failed to launch, it detached its silk thread and sat back down (dejectedly?). I imagined the spider’s disappointment at having steeled itself for a potentially long trip only to find that it wasn’t going anywhere after all. As I walked off, I left the spider with good wishes that it would catch a better breeze in the near future, but also with a silent warning. It’s great to go to new and different places, but sometimes travel just helps you appreciate how nice it is to be home. 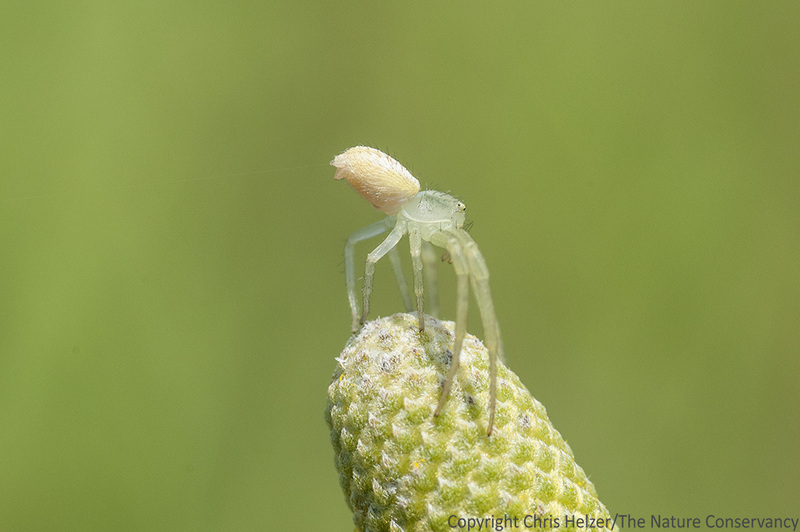 This entry was posted in Prairie Animals, Prairie Insects, Prairie Natural History, Prairie Photography and tagged ballooning, crab spider, kiting, nebraska, photography, prairie, silk, spinnerets by Chris Helzer. Bookmark the permalink. Nice capture. Your were in the right place at the right time. I’ve wondered how they manage to get their kite up without tangling. Was it sitting on a flower like this? Thanks. Yes, it was on that same flower species, but on a pure yellow morph. Wonderful story and such a teaching opportunity! Thanks for, yet again, a great post. Great pictures & great commentary! Steve Schwartzman’s bug is advertizing its bad flavor. Gorgeous photos. Looks like a Misumenops species though it’s hard to tell for sure at the side angle.